NOTE: This content is old - Published: Wednesday, Jan 16th, 2019. A trio of international students from Wrexham Glyndwr University have helped launch a programme of concerts at the Tŷ Pawb Markets, Arts and Culture Hub. The Glyndwr European Ensemble – made up of Computer Science student Angelo Cavallaro, composites researcher Adrien Djian and Sound Technology student Prisca Benouaret – performed an hour-long concert as part of the Live Music Showcase. Held every Thursday at Tŷ Pawb between 1 and 2pm, the showcase is supported by the Wrexham Symphony Orchestra, Calon FM, the Music Place and Tŷ Pawb and runs through until April. The three students –two from France and one from Germany – performed on piano, guitar and violin. Prisca – who opted to study the third year of her Sound Technology course after studying two years in France – said: “I was a little bit nervous at first, but it ended up being really good. I’m currently working on my third year submission for my course, so taking a break from that was great. During her year in Wrexham, Prisca is also playing second violin in the Wrexham Symphony Orchestra, the orchestra in residence at Glyndwr. With both staff and students taking part in WSO performances, the orchestra have developed a close relationship with the university in the half century since they began as the Clywedog String Ensemble. Deputy Vice Chancellor Professor Claire Taylor is among the staff members who play in the orchestra, where she performs on violin alongside Prisca. She said: “As a university, we are delighted to provide the base that the Wrexham Symphony Orchestra needs in our town. The coming year is set to be a milestone as the orchestra marks fifty years in Wrexham with a series of concerts – kicking off with a collaboration with the Welsh National Opera on February 23rd in the William Aston Hall. This concert will be the annual President’s concert, with current president Professor Maria Hinfelaar, Vice Chancellor of Wrexham Glyndŵr University. Spokesman Derek Jones said: “ We are working hard to strengthen our links across our local and regional community and Live Music Showcase is just one of the examples we actively support. 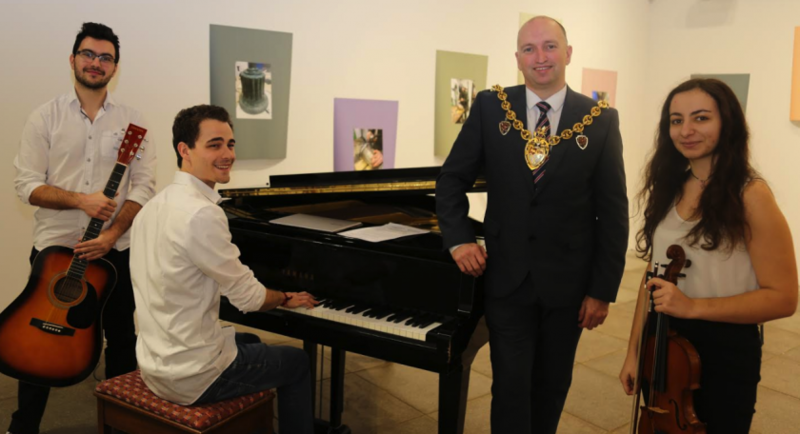 “We have a strong belief that musical education is a critical part of a young person’s development and the New Wrexham Music Festival, a collaboration with the University and Tŷ Pawb, is designed to support our children and young people by offering them opportunities to perform recitals in front of a live audience”. Wrexham Music Festival 2019 will be held in Tŷ Pawb from the 15th to 18th April and details can be found at www.wrexhamorch.co.uk or on Facebook from @wrexhammusicfestival. They are also available from Tŷ Pawb.